EAA AVIATION CENTER, OSHKOSH, Wisconsin — (December 26, 2018) — Fatal accidents in experimental category aircraft, including amateur-built aircraft, continued their decline during the Federal Aviation Administration’s 2018 fiscal year that ended September 30, falling to historic lows. For the 12-month period from October 1, 2017, to September 30, 2018, fatal accident totals for the experimental category overall, including amateur-built aircraft, racing aircraft, those used for exhibit only, research-and-development, and some types of light-sport aircraft, dropped for the fourth straight year. 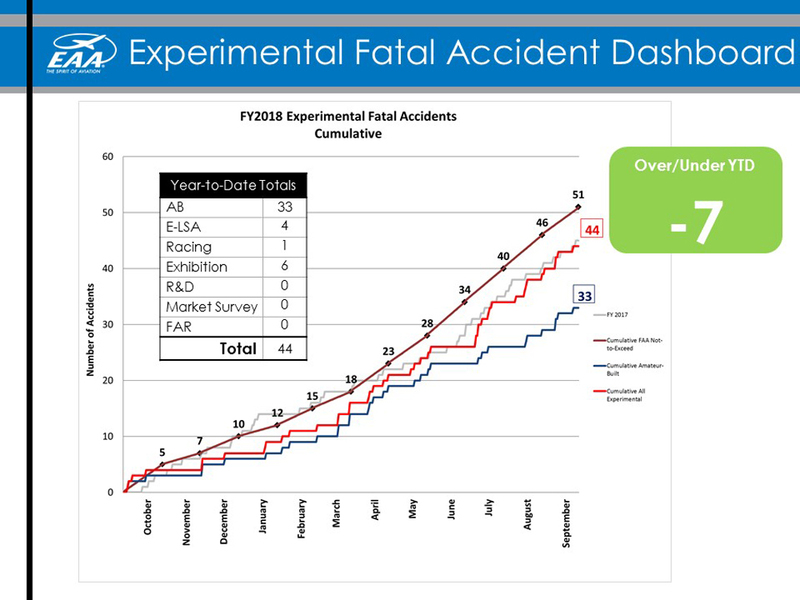 Total fatal accidents fell two percent, to 44, during the 12-month measurement period ending September 30, 2018. The final figures are nearly 14 percent below the FAA’s “not-to-exceed” goal of 51 fatal accidents for that period. This continues an improving trend of lower fatal accident totals, even with increasing flight hour totals according to FAA data. Since 2015, the FAA has set successfully lower not-to-exceed targets for experimental category aircraft, from 64 in 2015 to 51 this past fiscal year. Elliott noted that the overall fatal accident numbers remain much lower than other recreational pursuits, such as paddle sports, skiing and snowboarding, and driving all-terrain vehicles. EAA has worked closely with the FAA and the National Transportation Safety Board on recommendations to reduce fatal accidents, including through participation in the FAA General Aviation Joint Steering Committee that EAA co-chairs. The EAA focus has also included the newly released EAA Flight Test Manual for amateur-built aircraft; the Founder’s Innovation Prize competition that seeks innovations to reduce loss-of-control accidents in amateur-built aircraft; and use of an additional safety pilot during initial flight testing in amateur-built aircraft. EAA embodies the spirit of aviation through the world’s most engaged community of aviation enthusiasts. EAA’s 219,000 members and 900 local chapters enjoy the fun and camaraderie of sharing their passion for flying, building and restoring recreational aircraft. For more information on EAA and its programs, call 800-JOIN-EAA (800-564-6322) or go to www.eaa.org. For continual news updates, connect with www.twitter.com/EAA.